Tony Berendsen says the ArrowCreek Community will have a fantastic view of the 5 planets along the Eastern horizon right from our neighborhoods. If you’d like more instruction about it, there is an opportunity to meet with Tony and other astronomers at the UNR Redfield campus on Mt Rose Highway & Wedge Parkway across from the Raley’s shopping center around 5:30 in the morning on Wednesday, January 27, 2016. Mercury should come up over the horizon and into view around 6:20. It will be followed by the other planets. 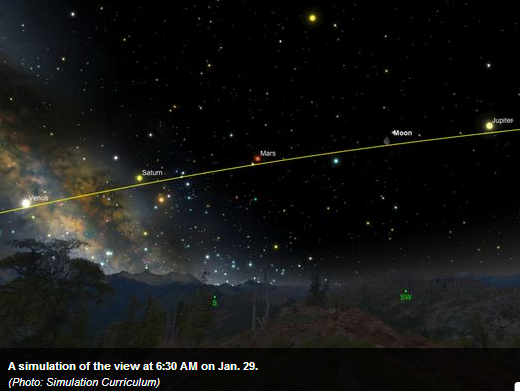 Five naked-eye planets ride the early morning sky in late January and early February. They are recast, like the characters of a Sergio Leone spaghetti Western “A Fistful of Dollars,” where Sergio portrayed western cowboys in a realistic fashion, rather than the traditional “villain wears black, hero wears white” structure of early Hollywood. As we gaze at the original five naked-eye planets over the next few weeks, we see them in new light,and with a depth of knowledge. No longer do the planets represent mythological gods, nor does our understanding of them suffer from the crude blurry telescopic images of early planetary ground-based exploration that left many to imagine canals, vegetation, and alien civilizations. Instead the planets are cast in the stark realism of modern science. We have been to all of these planets; some of them many times. We have gone to them via robots sending back a Robert Ballard-style telepresence to our computer monitors, TVs and periodicals. Our children know them as “other worlds,” and in the near future some of them will set foot on at least one of them. In comparison to the Earth, the planets vary wildly in size and environment. The only planet similar to our home is Mars, but even though it was once wet, it’s a very different and hostile place. Dusty, arid and cold, with almost no magnetic field to keep harmful cosmic rays and high energy particles from hitting its surface, we would not survive its surface without spacesuits and enclosed habitats. Venus, the brightest of the naked-eye planets, is the most similar in size to the Earth. It is our closest neighbor and is even more hostile than Mars, with atmospheric pressures similar to ocean depths, lots of carbon dioxide, sulfuric acid rain, and surface temperatures so high lead would melt! The surface of Venus is completely obscured by clouds. We have only see the surface by Russian landers and radar mapping. Mercury is the nearest planet to the Sun, and only sightly larger than our Moon. It it is a dense barren globe of rock and iron with the thinnest atmosphere of all the planets. Daytime temperatures can be as high as 800 F and because of the thin atmosphere the temperature can drop to -280 F at night. Jupiter is the largest and second-brightest naked-eye planet. It is tremendously larger than the Earth and big enough that it could fit within its volume all the planets and the asteroids too. Jupiter is a gas giant with an atmosphere so thick that pressures would be greater than the bottom of Earth’s oceans before finding solid ground. Saturn is the most distant of the five at almost 900 million miles from the Sun. It takes light about 8.3 minutes to travel from the Sun to the Earth, but almost 80 minutes to reach Saturn. Saturn’s rings make it the most distinctive-looking planet in the solar system. It has a low density too — so much so that if you had a cosmic ocean large enough it would float like a ringed fishing bobber. The early morning “fistful of planets” lineup begins the last week of January and continues for the first couple weeks in February. On Jan. 29, 2016 at 6:30 AM, check out the view: Mercury on the eastern horizon, then Venus, Saturn, Mars, and Jupiter all strung along the ecliptic toward the west with the Moon in between Jupiter and Mars. Mercury can be the most difficult to find, so I suggest loading up the SkyPortal astronomy app to help. Find a vantage point with a clear view of the eastern horizon and arrive a little early to find your bearings and enjoy a rare glimpse into the solar system. Reprinted with permission from Tony Berendsen, aka Tony the Star Guide. He runs Tahoe Star Tours. He can be reached at 232-0844 or tony@tahoestartours.com. This entry was posted in ArrowCreek 411, ArrowCreek411, Tahoe Star Tours, Tony Berendsen and tagged Tahoe Star Tours, Tony Berendsen. Bookmark the permalink.